It took me long enough, but I finally got a chance to see Scream 4, the latest in a series of movies I kind of dig. I really liked the first one, at any rate. I also liked some of actors involved so I thought it was worth a shot since I needed something to watch while exercising. Overall, it's a decent enough slasher, but not a patch on the original. It takes place fifteen years after the original murders in the film. There are seven Stab movies. Dewey is sheriff. Gale is bored. Sydney has moved on with her life and wrote a book about it and has come back for the book tour. Of course, someone has decided this is a good time to start murdering people again. For the most part, we focus on a new cast of teens, led by Emma Roberts and Hayden Panettierre. The returning cast interacts with them quite a bit, though their efforts at solving the crimes are rather minimal at best. Actually, come to think of it, not many of the characters seem all that concerned that people are getting killed. People go wandering off alone. Parties are thrown. Girls go walking up into empty houses when they could have stayed with friends. Not the best decisions they've made. 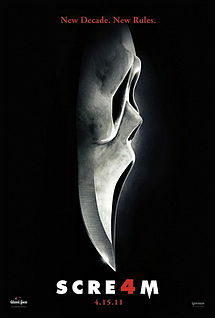 It's a serviceable enough slasher and the costume and look is effective as ever, with Ghostface popping up out of nowhere to terrorize his victims. My only big complaint would be in the ending set piece, where two characters have a rather big brawl despite having lost a lot of blood from stab wounds. That just seems unlikely. I think ultimately, it fails as it doesn't have enough balls to it and while the newer characters are all up for grabs, the older ones seem safe and untouchable because of marquee presence alone. If the movie actually ended where you think it does, it would have been stellar. Grim, but stellar. As it stands, there's another ten minutes or so to get through and while it is exciting, it undoes all the goodwill that it has earned up to this part. Yesterday, I got the sad news that Ray Harryhausen had passed away. If you're not familiar with him, you should be. He was a groundbreaking animator whose works with models rival or surpass many modern effects in their realism. Mighty Joe Young. The Kraken. The skeletons from Jason and the Argonauts. Ymir. All of these and more were burned into the brain of a young kid sitting in front of the tube on a Saturday afternoon and helped fan the fan of love for science fiction and fantasy. Thanks for all the hard work, Mr. Harryhausen. You will be missed, but not forgotten.